With Back to School just around the corner, this is a freebie you are not going to want to miss! As much as I don't want the kids to head back to school yet... I know that it is almost time to start thinking about getting their back to school clothes and supplies. 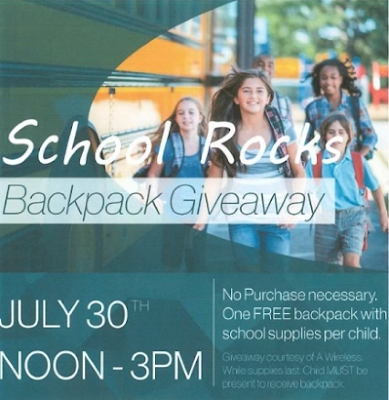 On July 30th, you can get a FREE backpack filled with school supplies at your local Verizon TCC Store from 12 pm to 3 pm. This offer is valid while supplies last and only at participating stores, so you might want to call ahead if you are making a special trip into town. You can check for a participating store near you by going here. I have three locations in my area! Parents and kids are invited to come to participating TCC stores on July 30th from 12pm to 3pm to receive a special filled backpack. Each backpack is filled with glue sticks, spiral notebooks, pencils, rulers, folders, and pencil boxes, so that each child can go to school feeling confident and ready to learn. Backpacks will be available while supplies last and the child must be present to receive the backpack. I stopped by your blog today. It looks like you are on the same path as I am with frugal living.